Honda is previewing the hatchback version of the new, 10th-generation Honda Civic. We’re expecting to see Honda’s Golf-fighting compact in the metal for the first time next month on the opening day of the Paris Auto Show. 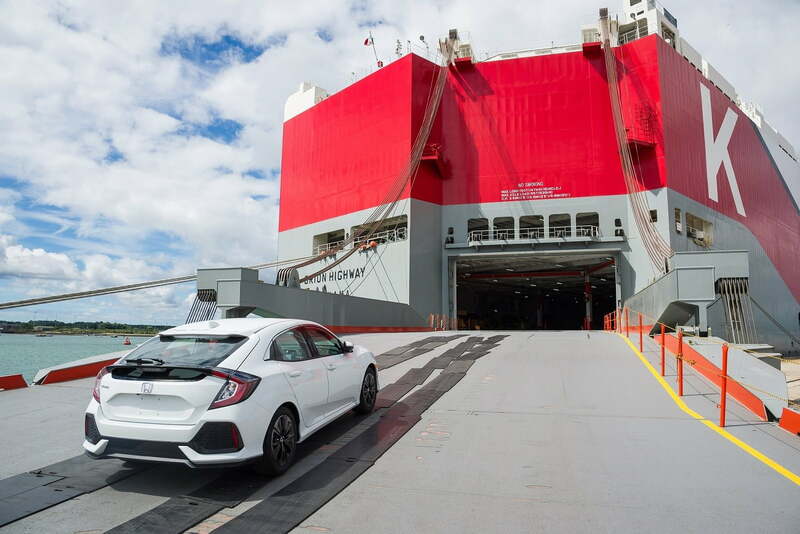 The images confirm that the Civic Hatchback is essentially a toned-down version of the Civic Hatchback Concept that debuted earlier this year at the Geneva Auto Show. Its back end gains angular, C-shaped tail lamps connected by a strip of trim that doubles as both a third brake light and a spoiler. Large air vents integrated into the bumper and a roof-mounted spoiler add a sporty touch to the overall look. Hatch aside, the new variant of the Civic is expected to be all but identical to the existing sedan and coupe versions. That means buyers will initially be asked to choose between a naturally aspirated, 2.0-liter, four-cylinder engine that makes 158 horsepower and a turbocharged 1.5-liter four-banger rated at 174 horses. Official technical details haven’t been published yet, however. The Hatchback will spawn the next track-oriented Type R a little later in its production run, and it sounds like it will be well worth the wait. Earlier rumors claim the upcoming Type R will look a little bit tamer than the current model, but it will turn the performance dial up to 11 with a turbocharged 2.0-liter four-cylinder tuned to 340 horsepower. The R will remain front-wheel drive, which is surprising for a hot hatch with 340 ponies on tap. The other surprising bit of information about the Hatchback is that it will be sold in the United States for the first time in recent memory. As we previously reported, adding a new body style to Honda’s U.S. lineup will help the company’s Swindon, England, factory boost its output by about 30,000 to 40,000 units annually. The Honda Civic Hatchback will arrive on dealer lots before the end of the September, and we’ll be on location in Paris to bring you a full set of details and live images. Volkswagen might want to take notice, because the Civic Hatchback won’t be the only car in Paris that wants to lure Golf buyers. South Korean rival Hyundai has previously announced plans to introduce the brand new i30, which is sold as the Elantra GT in the United States. Updated on 08-15-2016 by Ronan Glon: Added official information and pictures.